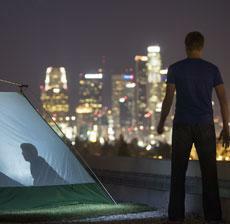 Camping for a cause | USC students Chris Kass and Stephen Gordon lay a 35 sq. ft. piece of sod and camp on top of Vivian Hall. The students are campaigning for a more environmentally conscious campus, which includes adding green roofs on buildings. The smoggy haze looming over downtown’s city lights indicate why two USC students have camped out on campus rooftops since Sunday. In light of USC’s failing grade in environmental sustainability, Chris Kass, a junior majoring in fine arts, and Stephen Gordon, a junior majoring in international relations, wanted to demonstrate a possible solution through a “green” art project. At the end of last month, the Sustainable Endowments Institute ranked USC among the bottom 12 universities in the nation that have the largest endowments but lack environmental consciousness. Their purpose was to open up a discussion of just one of the many possibilities to make the campus more environmentally friendly, Gordan and Kass said. “We thought it would be cool to see the dichotomy of the deadness of the building and how there could be life on top,” Gordon said. “I read about different renovations done in industrial areas to make it more green,” he said. Green roofs are building tops layered with a waterproof membrane and topped with soil, grass and shrubbery. They can help the environment in a number of ways, said Joseph S. Devinny, a professor of environmental engineering. The eco-friendly roofs provide good insulation, filter rainwater, reduce pollutants and cut heating and cooling costs, Devinny said. Thomas Spiegelhalter, a professor of architecture and sustainability, has worked with using this type of roof for almost 20 years across Europe. As a member of the USC Environmental Management System, he sees green roofs in USC’s future. Green roofs are prevalent in Europe; about 10 percent of buildings in Germany have already carried out this initiative, Spiegelhalter said. But there is no need to look very far for a green roof success story. The California Science Center School implemented a green roof with their new school building in June 2004, said Tony Budrovich, the center’s deputy director for operations. “You can see it from the Radisson, and instead of seeing metal roofing tiles, you get to see this beautiful green environment,” Budrovich said. The juniper-covered roof is one of three green roofed buildings in Southern California. So far, the roof has proved to be nothing but beneficial, Budrovich said. “First, it’s about 15 percent energy-saving in the summer months, (it) creates oxygen for the environment and is better to look at (than) a hard cement surface,” Budrovich said. “It’s also very low maintenance, using underground irrigation drip to minimize water use,” he said. He said it would be a good consideration for USC buildings but that it is hard to retrofit an existing structure. “New building applications should consider it, but the difficult part is having an architect with a vision,” Budrovich said. Doubters of green roof projects are concerned with the cost of implementing the structures, but money will be saved in the long run, Spiegelhalter said. “We need to look at this option in a very holistic way. It can also help the university meet certain state environmental standards,” Spiegelhalter said. Kass and Gordon are spending their last night tonight on top of another building, pitching another tent alongside 35 sq. ft. of grass. “I’d think it would be really cool if we could open up a dialogue of what USC is doing for the environment,” Kass said. This entry was posted on Monday, February 19th, 2007 at 4:11 pm. It is filed under Print. You can follow any responses to this entry through the RSS 2.0 feed.